and the system schematic is the following where F(s)G1(s) = G2(s). For the original problem and the derivation of the above equations and schematic, please refer to the Suspension: System Modeling page. 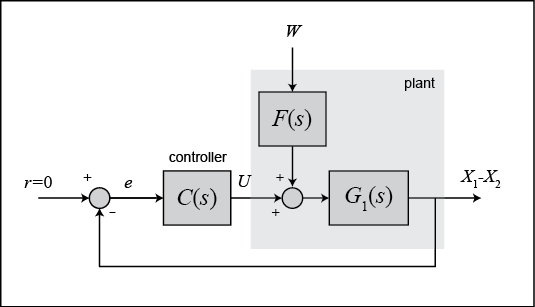 We want to design a feedback controller so that when the road disturbance (W) is simulated by a unit step input, the output (X1-X2) has a settling time less than 5 seconds and an overshoot less than 5%. For example, when the bus runs onto a 10-cm step, the bus body will oscillate within a range of +/- 5 mm and will stop oscillating within 5 seconds. The system model can be represented in MATLAB by creating a new m-file and entering the following commands (refer to the main problem for the details of getting those commands). 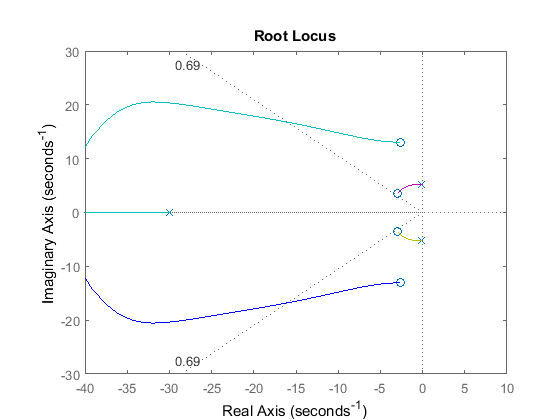 We are now ready to design a controller using the root locus design method. Therefore, the dominant poles are the roots -0.1098+/-5.2504i, which are close to the imaginary axis with a small damping ratio. Note from the specification, we required the maximum overshoot, , to be less than 5% and damping ratio, , can be found from the approximate damping ratio equation, . The command sgrid is used to overlay the desired percent overshoot line on the close-up root locus; you can find more information from commands list. From the plot above, we see that there are two pair of poles and zeros that are very close together. These poles and zeros are almost on the imaginary axis, they might make the bus system marginally stable, which might cause a problem. We have to make all of the poles and zeros move into the left-half plane as far as possible to avoid an unstable system. We have to put two zeros very close to the two poles on the imaginary axis of uncompensated system for pole-and-zero cancellation. Moreover, we will put another two poles further to the left on the real axis to get fast response. 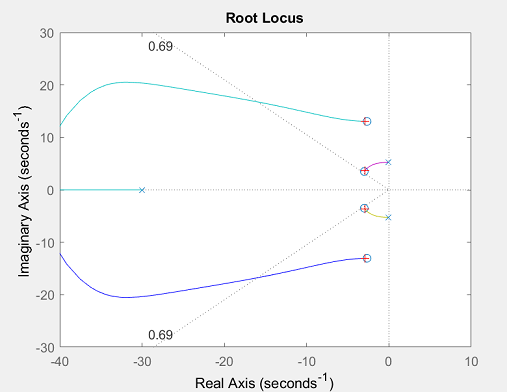 Now let's change the axis to see the details of the root locus. Now that we have moved the root locus across the 5% damping ratio line, we can choose a gain that will satisfy the design requirements. Recall that we want the settling time and the overshoot to be as small as possible. 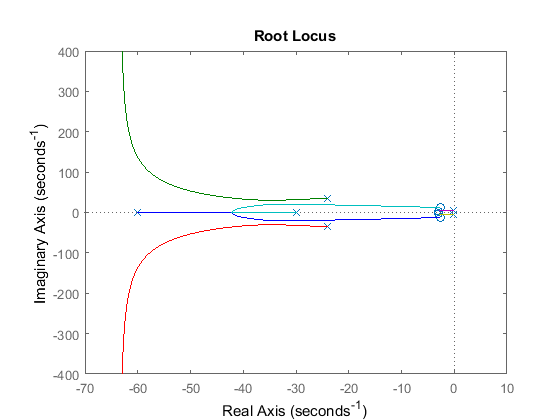 Generally, to get a small overshoot and a fast response, we need to select a gain corresponding to a point on the root locus near the real axis and far from the imaginary axis or the point that the root locus crosses the desired damping ratio line. But in this case, we need the cancellation of poles and zeros near the imaginary axis, so we need to select a gain corresponding to a point on the root locus near the zeros and percent overshoot line. 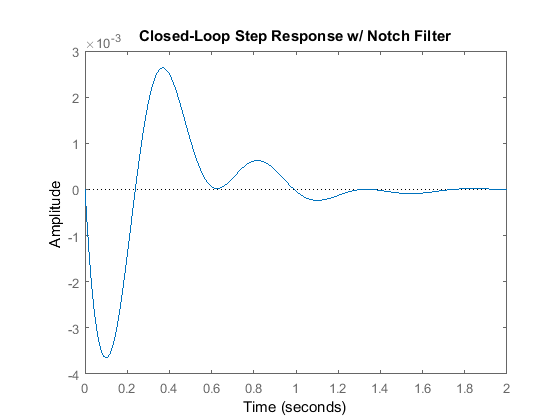 There is a method to do this with the rlocfind command in MATLAB. Add the code [k,poles]=rlocfind(C*G1) onto the end of your m-file to help you choose a specific loop gain. 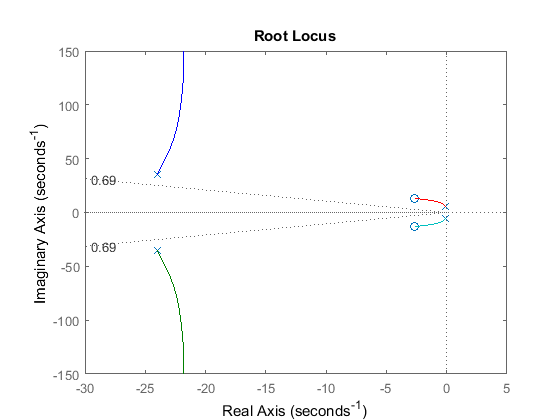 After running in the command window, go to the root locus plot and select a point near those indicated by the cross marks on the plot below. After doing this, you should see the following output in the MATLAB command window. Let's see what the closed-loop step response looks like with this compensator. Keep in mind that we are going to use a 0.1-m step as the disturbance. To simulate this, simply multiply sys_cl by 0.1. Add the following commands into the m-file and put % marks in front of all rlocus and rlocfind commands. From this plot we see that when the bus encounters a 0.1 m step on the road, the maximum deviation of the bus body from the wheel (or the road) is about 3.75 mm, and the oscillations settle in 2 seconds. Thus this response is satisfactory.